Finally, some knitting progress! I have a couple more inches to do on the body and then the fun part begins. 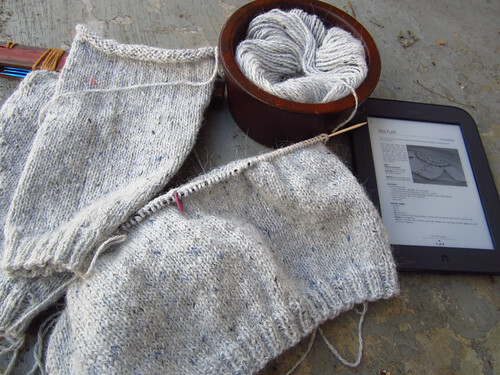 I love watching the design emerge in Fair isle knitting, and in the case of a yoke sweater the fact that you are closing in on the finish of the project and the rows are getting shorter, adds to the fun. Here’s how it looks so far. As much as I love the chance to actually wear all the garments that I have knit, and bestowed on the loved ones, I don’t relish the coming of cold weather. I know, it should be the height of a Knitter’s year to break out the woolens, but I really dislike winter. It is almost upon us once again as the trees bear witness to the fact. 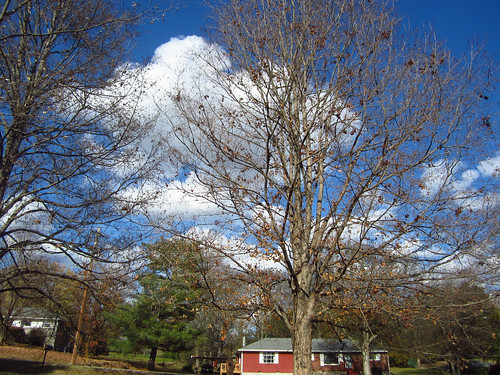 Just a week or so ago these maples were gloriously covered with orange and yellow flaming leaves. Alas, they are all gone and the gray will soon be upon us. I wish I had thought to get a picture of them. Middle Tennessee does have fairly mild winters but when all the deciduous trees are bare it starts to look..well…gray. At least the really cold spells are interspersed with warm ones and the snow and ice is minimal. I just tell myself it could be worse, and it is mercifully short. The colder weather normally only begins anywhere from late November maybe, and sometimes not until further into December, and the worst is past by late February or the first week of March. The Daffodils and Forsythia are blooming by the second week of March. The temperate climate is one of my favorite things about the area. Okay, I hope to be into the color work by my next post, so stay tuned.